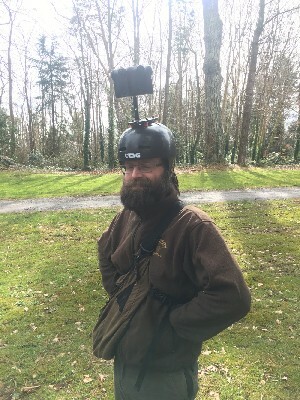 You can tell from his joyous expression that Conal very much enjoyed being part of a 360 degree film crew recently! 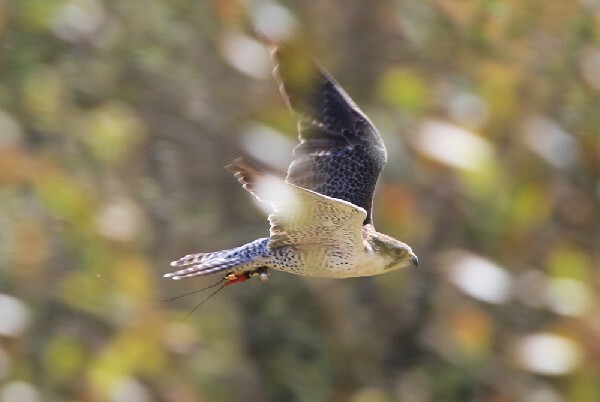 Thank you to Sean & Angela Kimmel for these great photos from their recent Hawk Walk. Sean & Angela flew Ispini & Bagun and took the opportunity to introduce them to the Seattle Seahawk 12 man flag! Another great photo from Sean & Angela Kimmel. 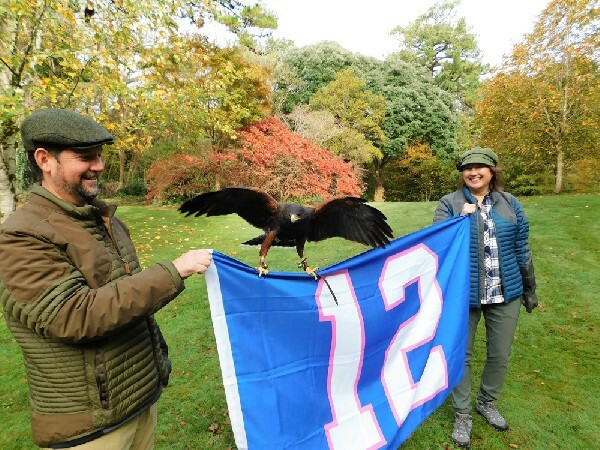 Here is Bagun getting acquainted with the Seattle Seahawks 12 man flag! 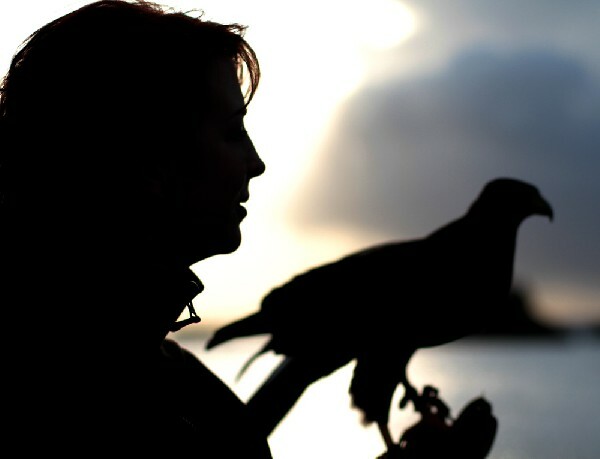 For World Falconry Day this year the theme chosen by the International Association for Falconry is Women Falconers. In recognition of this we are celebrating the wonderful team of women falconers who work here, starting with Danielle. 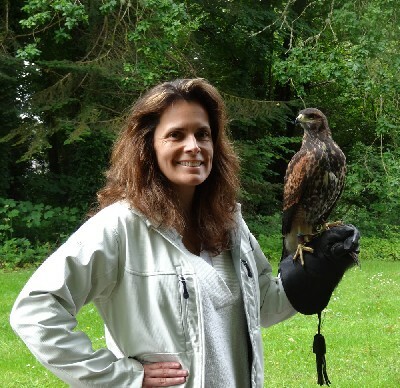 Pictured here on nearby Mount Gable with one of the young hawks. 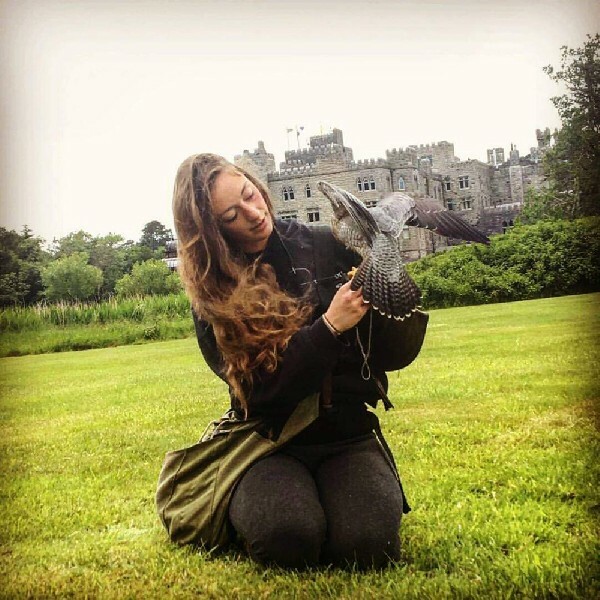 Here is wonderful Mel, pictured with Corrib (one of our Peregrine/Saker hybrid falcons) having just flown him by the castle. 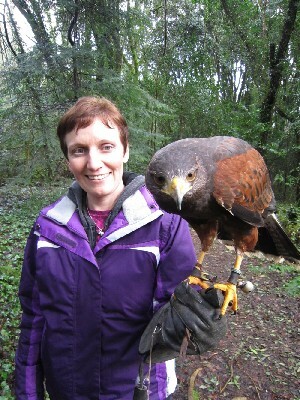 Here is Mary, with beautiful Maya, for World Falconry Day (Women Falconers). 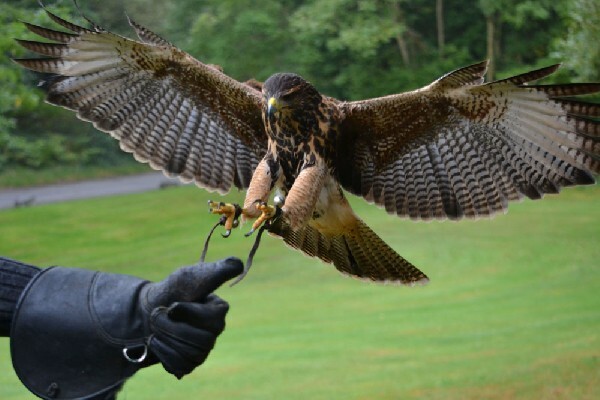 World Falconry Day was set up by the International Association for Falconry to commemorate the anniversary of Falconry recognition by UNESCO as an Intangible Cultural Heritage of Humanity. 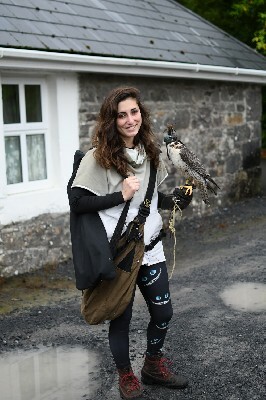 Here is Marine, just setting off to fly Corrib (our Peregrine/Saker hybrid falcon). Here is Meaghan and one of the new baby Hobbits, stopping for coffee at Mrs Teas coffee shop on the castle grounds. Thank you to Alan Kay for sending us this great photo from his recent Hawk Walk with us. Alan has flown hawks with us before so it was the perfect opportunity to try Pippin on his first ever Hawk Walk at just 4 months old! 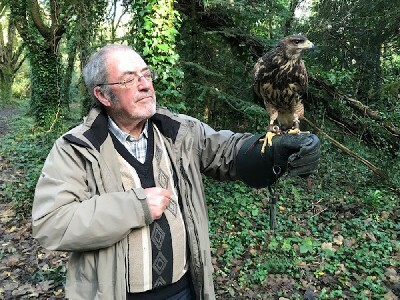 Pippin did very well and Alan did a great job of taking good care of Pippin, handling and flying him very sensitively throughout the Hawk Walk. 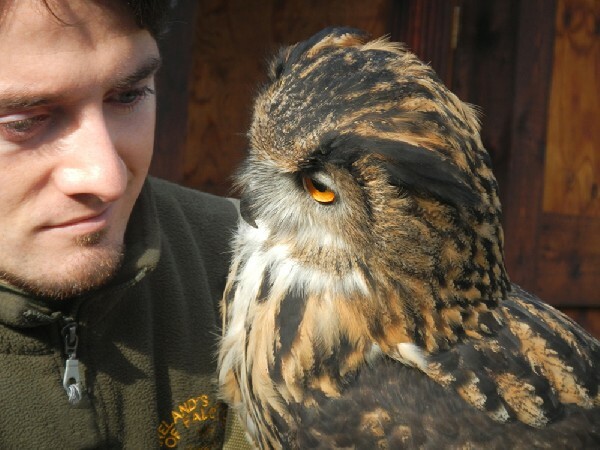 I love this wonderfully expressive photo of Joe with Dingle. 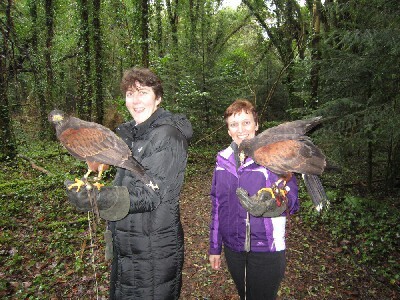 Rebecca & Kathleen Redshaw sent us this great photo from their recent Hawk Walk here. Rebecca & Kathleen flew Stoker & Maya with us. We really must speak to Yvonne about her photobomb habit! it is getting out of hand! The Hobbit babies at 3 months old! Here are the 4 baby Hobbits in a recent photo. 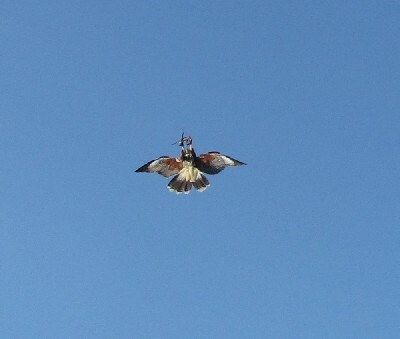 They are nearly 3 months old now and they fly every day. 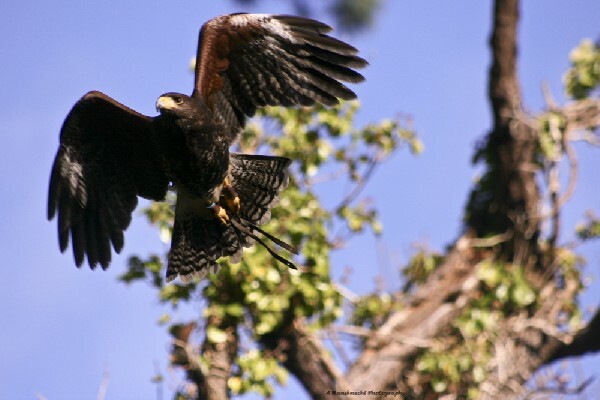 During their flying they are pretty much allowed to do whatever they want - exploring the woods, experimenting with their new found flying skills (or lack of skills!, they still find braking very tricky!) and playing with sticks and branches and pine cones. The world is a new and wonderful place for them to discover. From left to right we have:- little Pippin (having a lie down! ), then Samwise, Bilbo and Frodo. The Hobbit babies of 2018! Here they are, the class of 2018! 4 Hobbits! Bilbo (with the blue blob on his head) is the eldest, having hatched on July 9th. Frodo (the pink blob!) 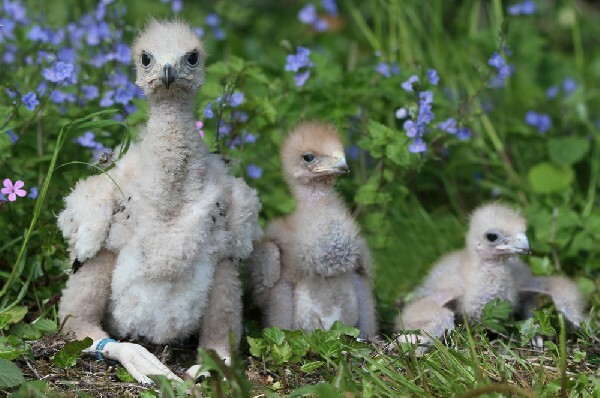 and Samwise (the one at the top of the photo with feathers beginning to show) both hatched on July 10th. Lastly, little Pippin (being squashed at the bottom!) hatched on July 11th. We are really enjoying them and getting to know their individual characters already. 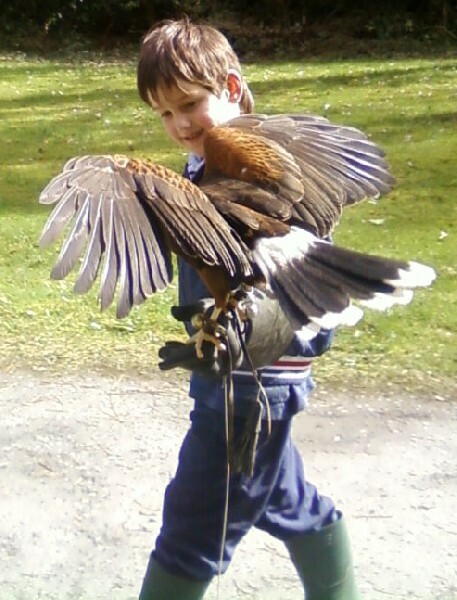 We love this photo from Sherry Green of her son, Michael, flying the hawks with us last May. 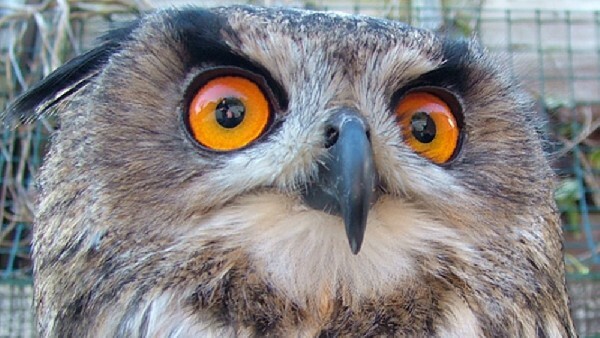 We are very much enjoying flying our latest arrivals. The Star Wars babies, so named because they were born on May the 4th, came to us when they were 2 weeks old and have just about finished training. 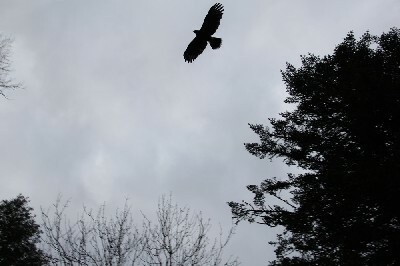 They are developing fitness and flying skills very quickly in the recent run of stormy weather. Here they are taking some time out. From the left we have - Chewie, Jabba, Yoda & Wookie. Three girls and just the one boy. 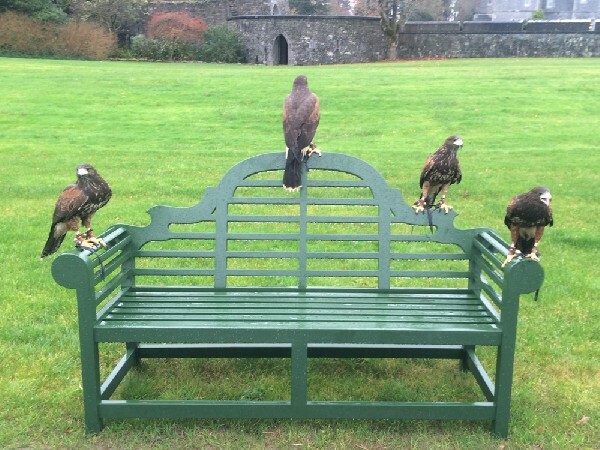 Wonderful Beckett, Swift & Joyce as taken by wonderful Falconer Joe! I love this photo of Beckett, Swift & Joyce that Joe took recently when he was flying them with guests on a recent Hawk Walk here. 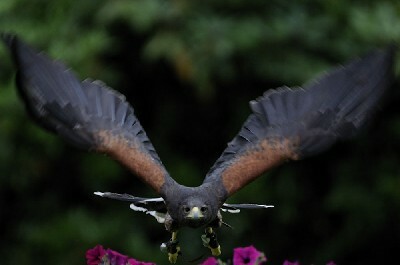 Jon Bennett took this amazing photo of Aztec soaring. 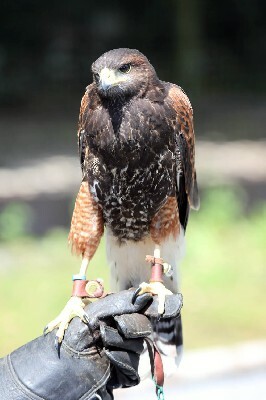 Jon flew Aztec during his recent Hawk Walk here. Aztec is the master of soaring! Thank you to Lauren Daknis for this great slow motion video of Maya landing. 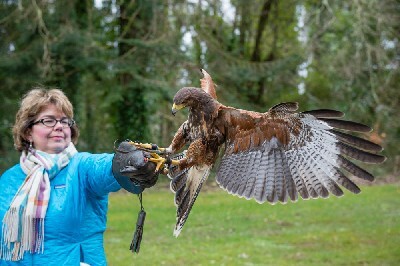 Lauren flew wonderful Maya during her recent Hawk Walk with us. 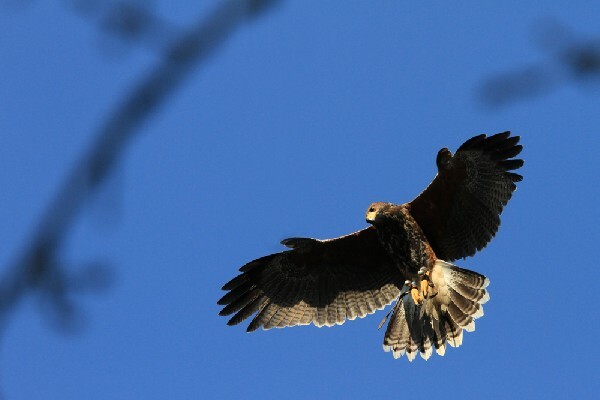 Thank you to the Kirby family for this brilliant slow motion video of wonderful Beckett & Wilde coming in to land during the Kirby family recent Hawk Walk with us. 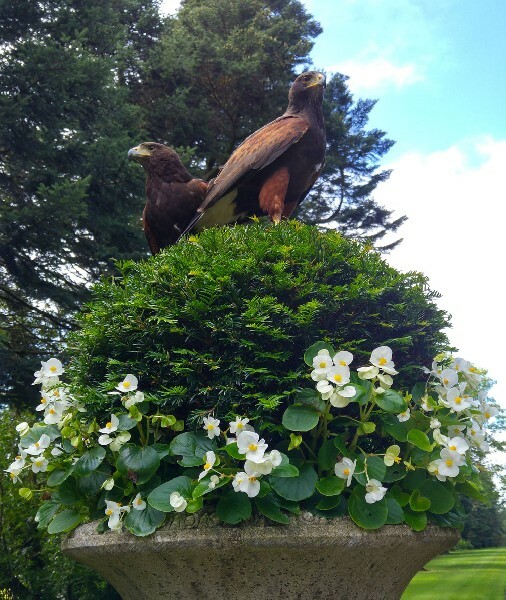 Joe took this great photo of Earrach & Wilde during a recent Hawk Walk. They think the new plant tubs in the castle gardens are a great addition! 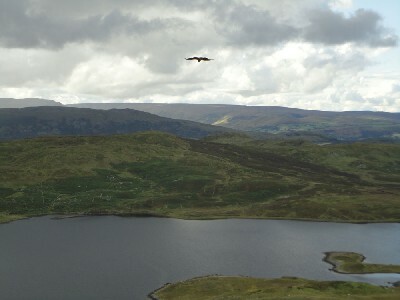 Anya captured this brilliant photo when we all took 5 of the hawks up onto nearby Mount Gable to fly. It is our favourite place to fly them. 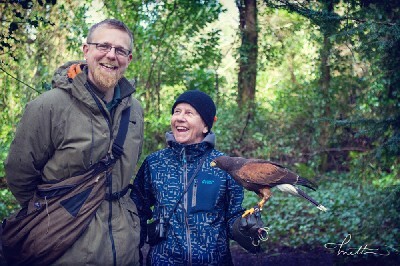 'H is for Hawk' translator flying Joyce with us recently. 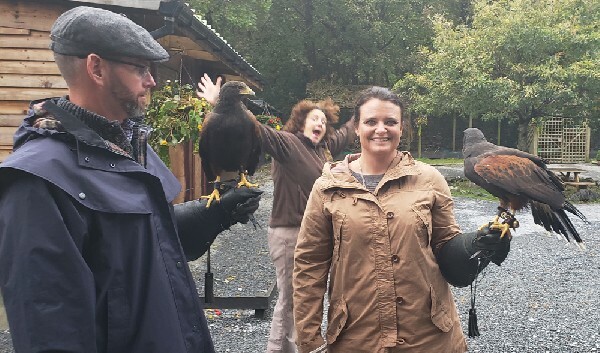 We were delighted to welcome Mette Ottosson, and her mother, Meta, here recently to fly the hawks with us. 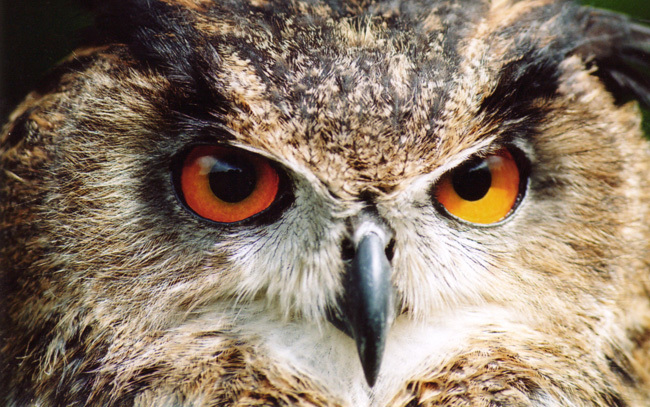 Meta is currently translating the wonderful book "H is for Hawk' into Swedish. Thank you to Wendy Hryniw for sending us this amazing photo of Dingle in flight. He looks really fast in this photo! and I love how far forward he flings his feet in preparation for landing! 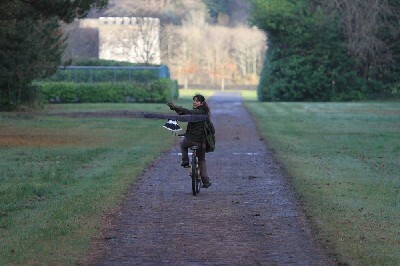 Milly coming in to land! I love this photo of Milly coming in to land on Don Wilkinson as he flew her recently during his Hawk Walk with us. Deb Wilkinson somehow managed to capture this great photo. Hawk Walk guest online blog. 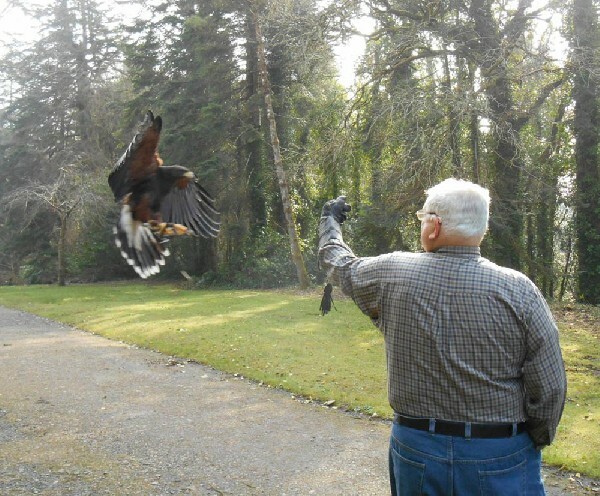 This is a great video taken by some of our guests during their Hawk Walk with us. 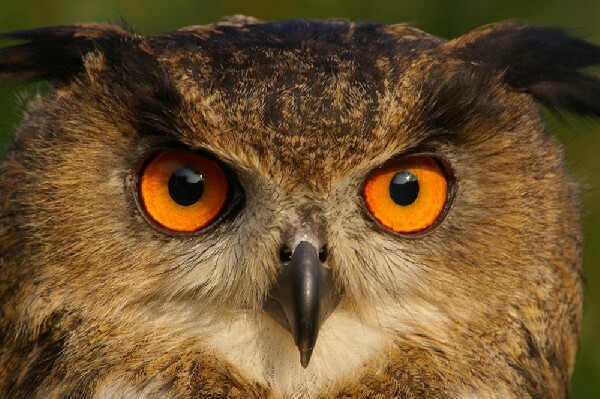 Beautiful close-up from Rayvin Brewer. 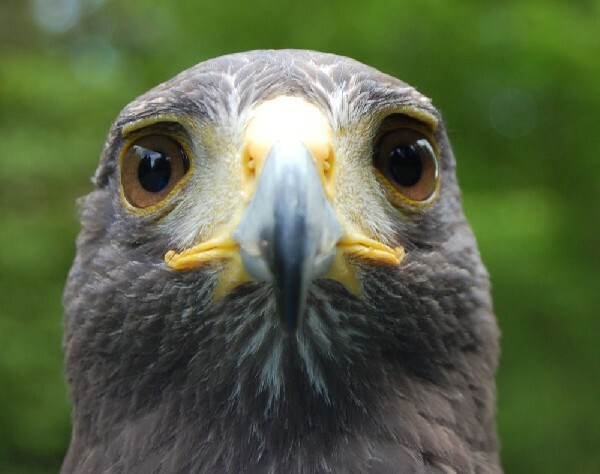 Rayvin Brewer sent us this fabulous close-up of Joyce from their recent Hawk Walk where they flew Joyce with her big sister Swift and her little brother Wilde. Here is Inca's latest training video. 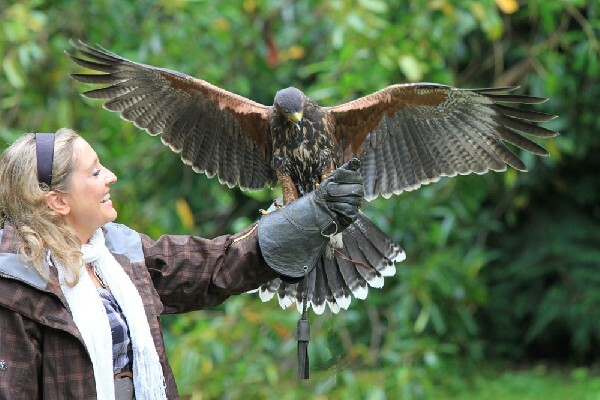 Last winter, Laura clicker-trained Inca (our young, female Peruvian Harris hawk) to pick up a specific pencil. This winter, Laura has taken her training a few stages further. 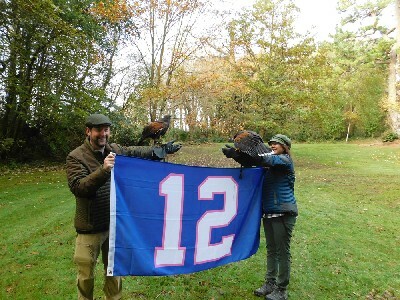 I love this photo that Peter LoJacono & Janna Howley sent in from their Hawk Walk. This amazing tree is one of our favourites from the woods surrounding us. The hawks are all "mouse hunting' by the look of them! 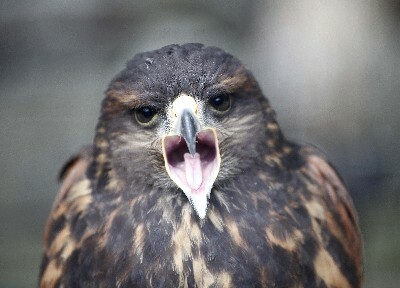 Joe Hohner of truenorthattitude.com sent us some outstanding photos of his family Hawk Walk. 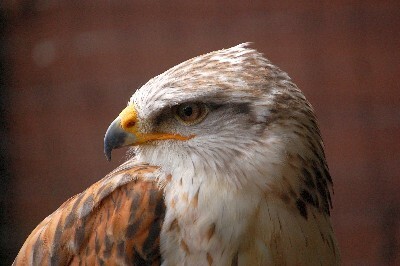 Here is just one, but the others are in The Hohner Family Hawk Walk Gallery on the Gallery page. 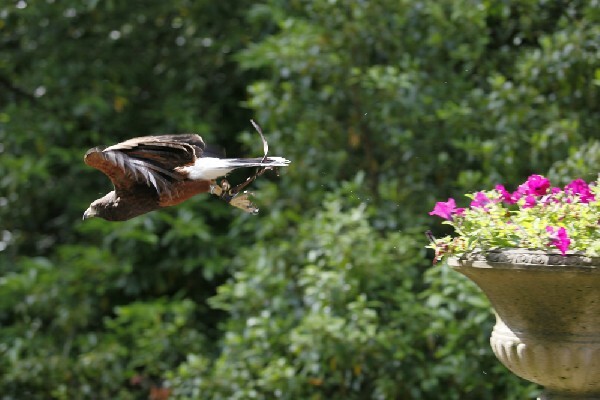 There are some great shots of Aztec & Chico landing and taking off. Beautiful Rua at Age 13 years. Thank you to Michael Rosenthal who sent us this brilliant photo of Rua when he flew her on his recent Hawk Walk. I love how this photo really shows off how big and formidable her talons are!!! She is looking and flying better than ever. 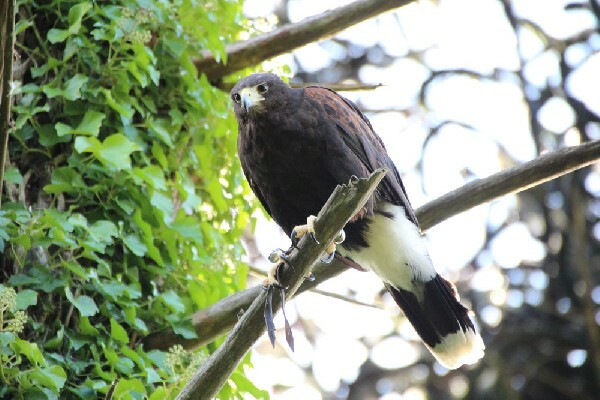 I love this fabulous photo of Inca landing that Steve Armstrong & Kylie Begg sent in from their recent family Hawk Walk with us. 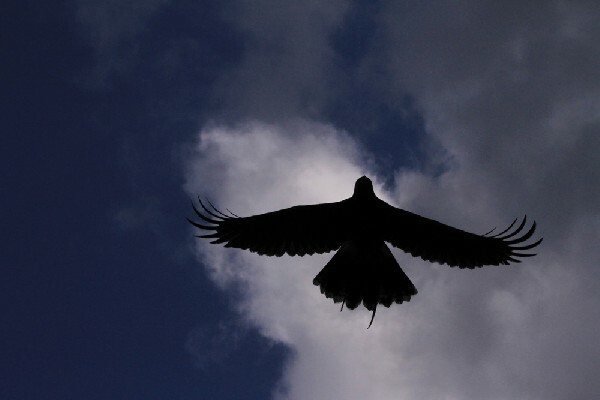 This silhouette photo shows how flexible the wingtip feathers are, how far they can bend upward to reduce wingtip vortices and thereby reduce drag. This is the same reason that modern aircraft now have wingtips that bend upwards. Swift demonstrates this beautifully. Updates on the new babies will follow shortly - they have just reached the age where they can begin to fly!! Musky and the new baby hawks. 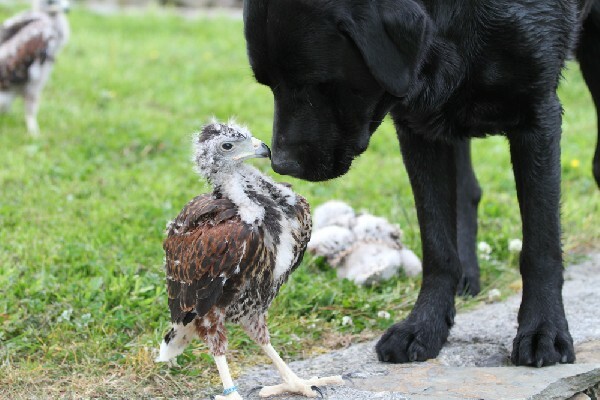 Musky, our black Labrador, takes his baby-sitting duties very seriously with the new baby hawks, but he did fail to notice the baby hawk behind him and accidentally sat on it moments after this photo was taken. He has since apologised and no harm was done!! New Baby Harris hawks 2013! Here they are at last, three of the four new baby Harris hawks. On the left is a full sister to Maya, Aztec & Chico. Next to her is a full brother to Wilde, Stoker, Swift & Joyce. 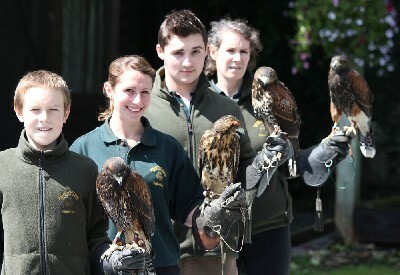 On the far right is a female Peruvian Harris hawk (full sister to Inca). There is a fourth one (a tiny male Peruvian Harris hawk) but he had to removed from the scene in disgrace after he refused to play nicely with the others!! Updates and more photos to follow shortly. 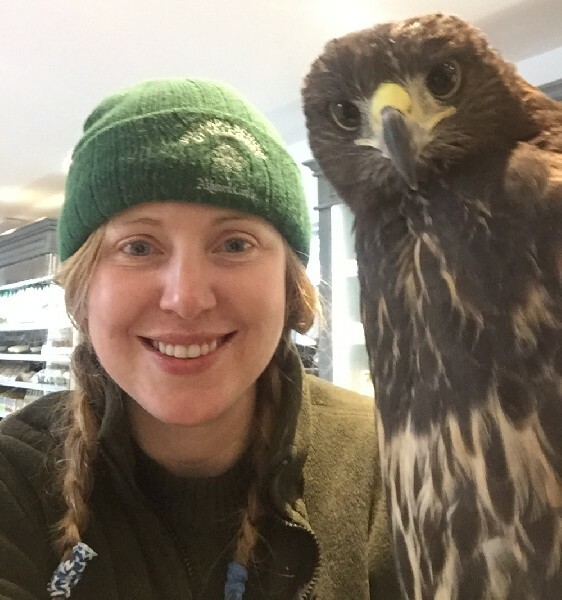 Laura has done brilliantly with her winter project of clicker-training Inca, our Peruvian female Harris hawk, to retrieve a pencil! This video shows her latest progress. Training complete! Killary flies so low across the lake that his talon tips drag through the water! 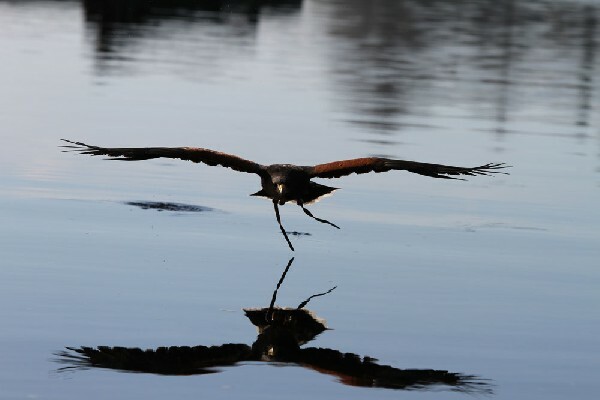 Killary is getting better and better at flying low across the lake in our efforts to re-create the scene from the film Ladyhawke where the hawk flies low over the water. 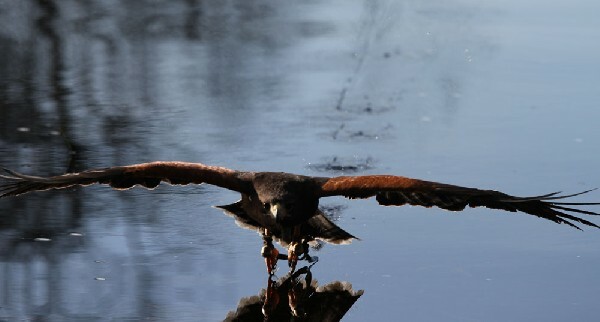 We have had great fun trying to re-create the scene from the film Ladyhawke where the hawk flies low over water. 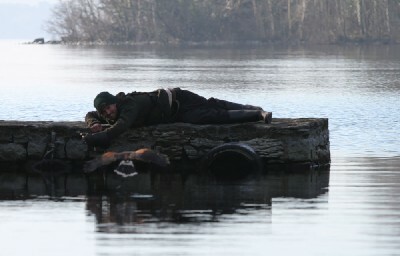 Eoin shows great dedication here as he lies on a frosty pier on a freezing morning! 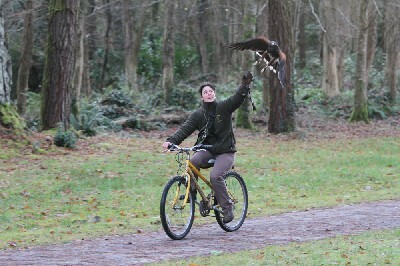 Using the bike is a great way for us to exercise the hawks during winter. Here is Aurelie flying the brilliant Rua yesterday. 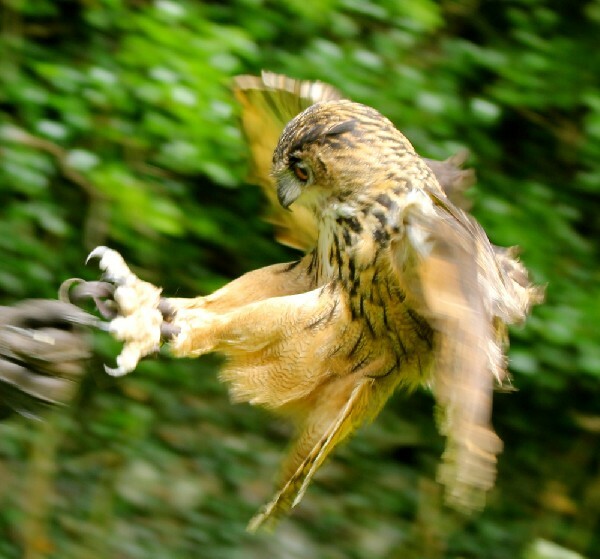 Thank you to Anne & Lisa Hansknecht for this fantastic photo of Chico taking off. 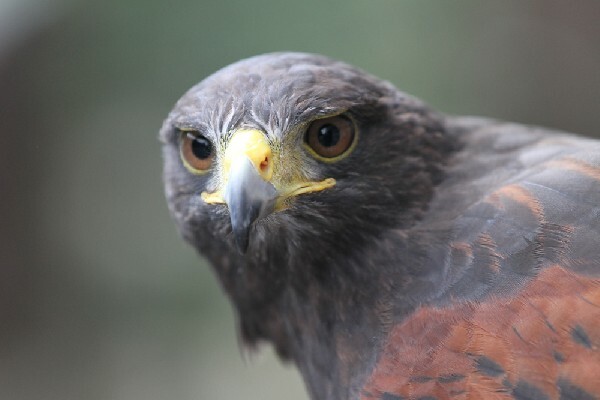 They flew him and his brother Aztec on their recent Hawk Walk with us and captured some brilliant photos. Here is an up to date photo of Fomhar for Mike Logan who flew him recently and wanted to see him again. He is an outstanding hawk, always looks immaculate and is one of the fastest and most powerful fliers that we have. Here is wonderful Sox. He couldn't decide whether to have ears that flop down or ears that stick up so he went for one of each! We are all missing him and Holmes, but they have promised to be back again next summer. 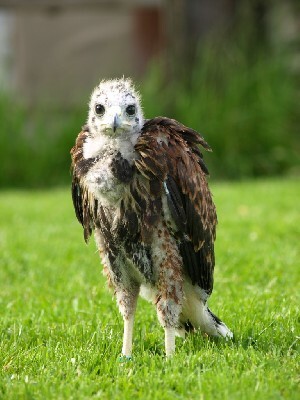 Here is little baby Inca, our Peruvian female Harris hawk, now about 3 months old, in mid-stoop. She is very chatty and sees no reason to stop during flying!! Maya & Inca flying, August 2012. Here is Maya & Inca play-fighting. All four babies are doing fantastically. 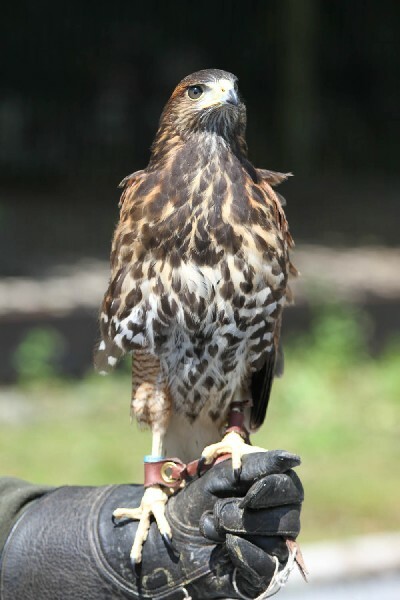 The two boys (Aztec & Chico) have started doing Hawk Walks and are just starting to do Hawk Walks together. The girls are still a little bit behind the boys. 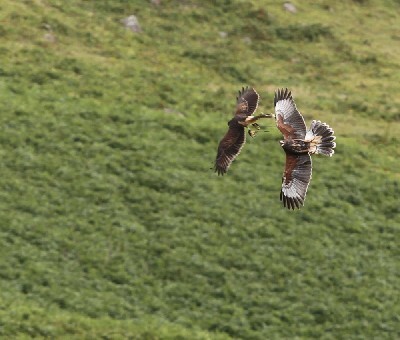 Here they are play-fighting to improve their fitness and flying and hone their hunting skills. Laurel Onfrichuk sent in this great photo of Dingle landing on her glove. He looks huge in this photo! More photos from Laurel's recent Hawk Walk, flying Fomhar with us, are in the July 2012 Guest Gallery page. Aztec's Second Ever Hawk Walk! Here is Jackie Nichols with Aztec on his second ever Hawk Walk. This was a bit more challenging for him as he encountered some dogs during his Hawk Walk. This phased him somewhat and he did sit in a tree and lose concentration for a bit longer than he should! Jackie did a great job with him and was very patient, even when he landed on her camera instead of the glove! Aztec's First Ever Hawk Walk!!! Here he is! Aztec in the middle of his first ever Hawk Walk. 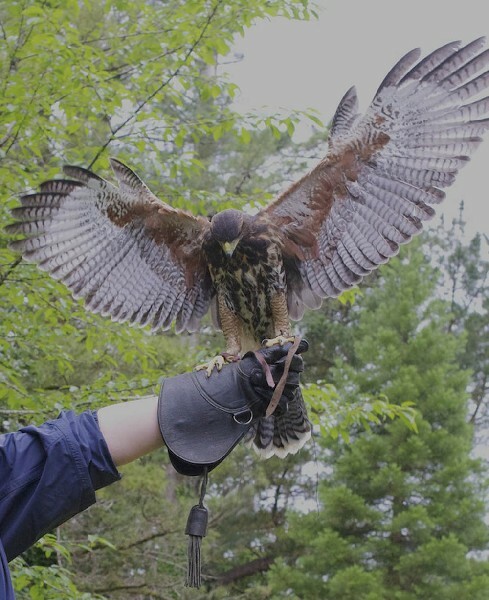 Patrick Daniel took this outstanding photo as his wife, Kathryn, was flying Aztec on his first Hawk Walk just the other day. He was very good and there weren't too many crash landings! Patrick took several brilliant photos and they are all in the Baby Harris hawks of 2012 Gallery. Aztec is still ahead of the other 3 babies, but only just. Chico is right behind him and even little Inca is catching up, although the other three keep bullying her! 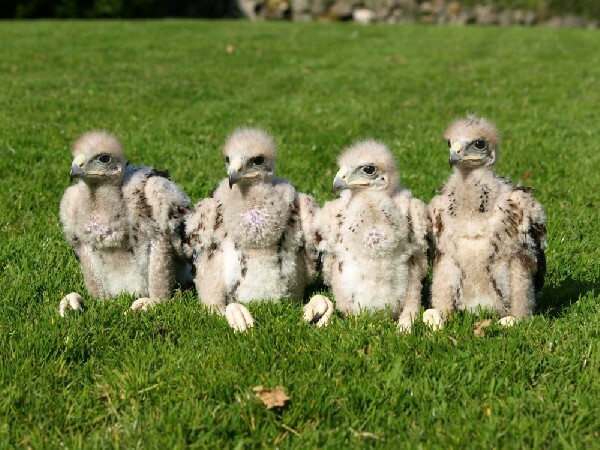 The baby Harris hawks of 2012 at 9 weeks old! Here they all are, this years baby Harris hawks. They are all flying free and making very good progress indeed. Considering their young age they are all quite advanced along their training and taking everything in their stride. Individual progress reports follow below. Maya at 9 weeks old! Here is Maya, the big female baby Harris hawk. She is going to be huge! She did the most flying she has ever done today and went the highest up a tree that she has ever been, all of which seemed to shock her a bit! Aztec at 9 weeks old!! 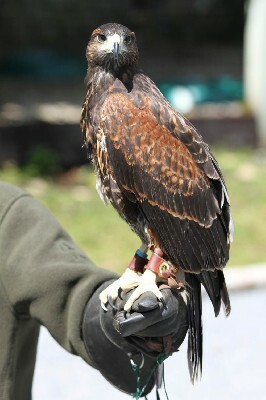 Here is Aztec, one of the male baby Harris hawk brothers. He gets the Gold Star award and is way ahead of the others. He is likely to do his first ever Hawk Walk any day now!!! Chico at 9 weeks old!! Here is Chico. He is only just behind his high-flying brother and will be ready to do his first ever Hawk Walk very soon!! He dangles his legs down as he flies and, when he is coming in to land, you have to almost catch him on the glove or he misses completely! Inca at 8 and a half weeks old! 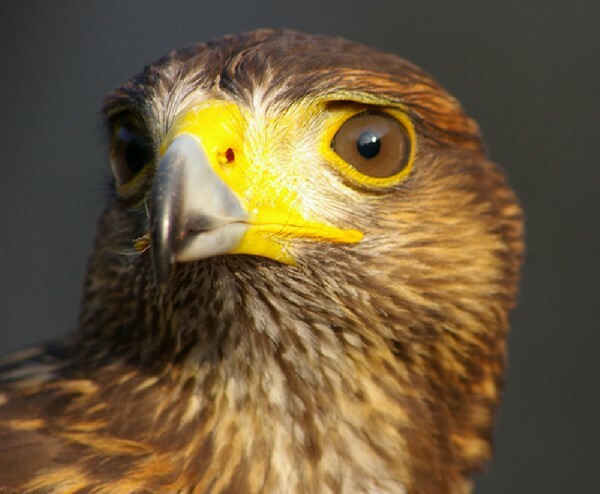 Here is Inca, the little Peruvian female Harris hawk. She is flying free, but only just and, at the moment, is scared of her own shadow. The babies at four weeks old!! Here they are at four weeks old! We now know that we have two boys and two girls. 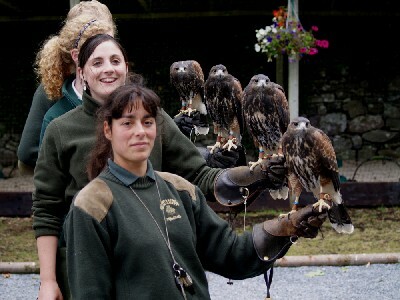 They are still living in the house with us in the evenings and at the Falconry School by day, but it is total chaos. The two boys are not happy with the high perches we provide for them and prefer our kitchen table! The two girls are no trouble at all and just stay in bed! Adolescence is such a difficult phase! There was a comical moment last night as this chap tried to fly the length of the kitchen! It was clear, shortly after take-off, that he had over-faced himself and he hung briefly in the air, as they do in cartoons, before crash landing on the floor! This one has had a bad hair day all day!!! There have been a few bad hair days, but this one has been particularly bad!!! Here they are, the four new babies at three weeks old! 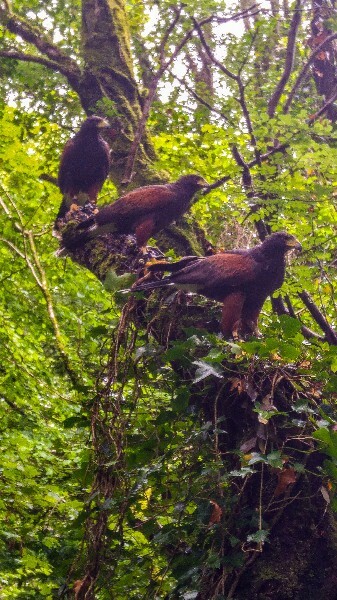 We think we have two brothers and a sister and one smaller Peruvian Harris hawk (possibly female???). 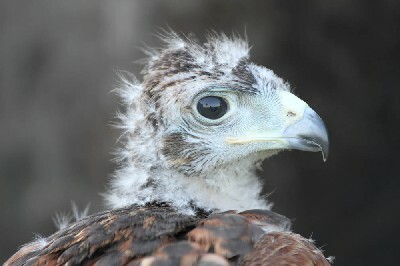 She is four days younger than the others and so obvious because of less feather development. We will keep you posted and more photos to follow shortly. Baby Harris hawks in Arizona! 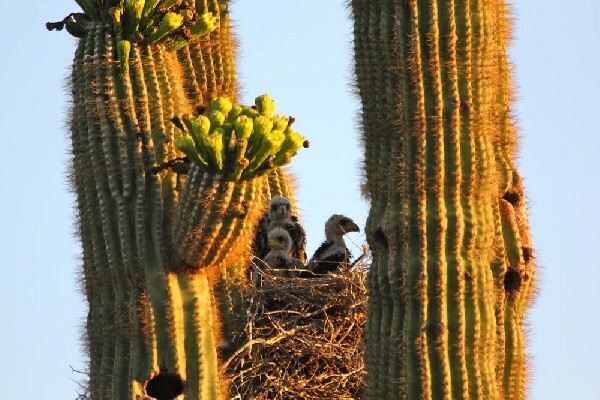 Joanne Black sent us this fantastic photo of some 4 week old baby Harris hawks in Scottsdale, Arizona. Our own babies are currently two weeks old and are about to have their first photo shoot if they will sit still long enough, or stay awake long enough! 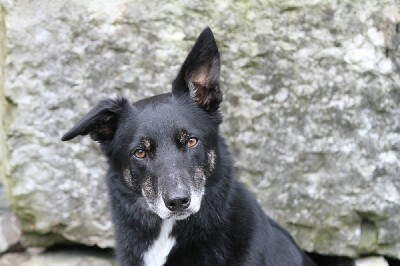 Hopefully, photos of the new arrivals will follow soon. Thank you to the Shea family for sending in this great photo of Mairi & Seamus with Jacob and one of his beloved ferrets. 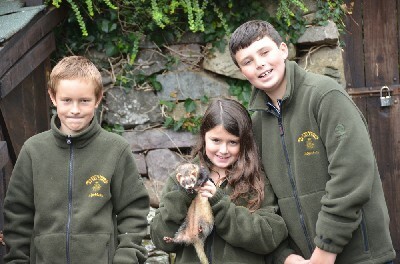 There is nothing to beat the lingering aroma of ferret that stays with you forever more after you have touched one! Here is Reg, our 21 yr old Ferruginous Hawk that we have had since he was a baby. He has just smashed his previous height record. His tiny altimeter read.......4,589 feet!!!! Reg, our 21 year old Ferruginous Buzzard has excelled himself and beaten his previous height record. His altimeter has recorded 2,078 feet!!! Smashing his old record of 1,575ft. We have had him since he was a baby and we have flown him almost every day since. We never tire of watching him "stoop' (vertically) from these tremendous heights when we call him down to us for his food reward. Here is Wilde showing off how good his flying skills have become now that he is nearly one year old! In other news, Reg (our 21 year old Ferruginous Hawk) was clocked at 1,300 feet by our small altimeter in the warm weather yesterday. Let's hope for a hot summer and see if he can beat last years record height of 1,575 feet!! Thank you to Audra Dalton & Leah MacDonald for this great photo of Wilde climbing up to catch a piece of meat we threw up for him then twisting upside down at the vital moment to grab it!! How on earth did they manage to capture this split-second moment? Considering he isn't quite one year old yet, he is showing off some impressive aerial skills! Amazing photos of Joyce & Dingle. Thank you very much to Marianne MacDonald and Elizabeth Rose for these two outstanding photographs of Dingle and Joyce from their recent Hawk Walk. Absolutely stunning. The detail in this photo is amazing. 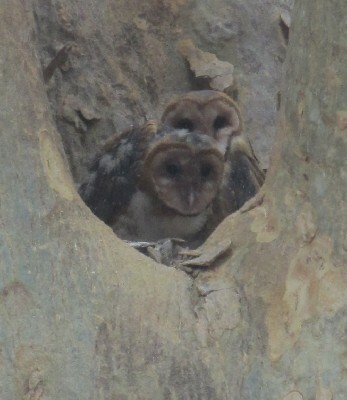 A hidden Owl family in Costa Rica! How on earth did Lauren & Jason Brown manage to spot this Owl family in a tree in Costa Rica recently! Thank you so much for sending in the photo. 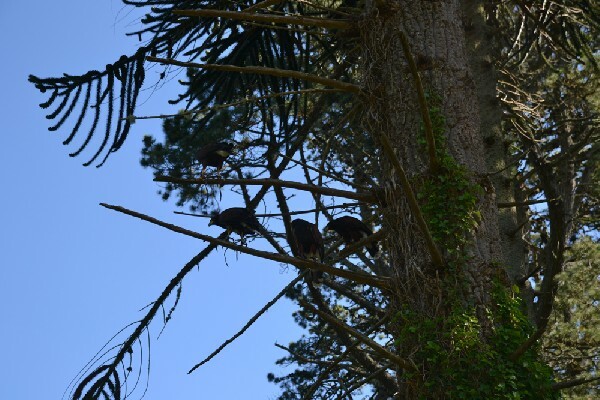 You can see a full photo of the tree they were in and how well camouflaged they were in this months guest gallery. Aoife sent this stunning photo of her flying Milly by the lake recently. Aoife used to work with us and returned recently to visit all her human and hawk friends! It was lovely to see you again Aoife, we all miss having you around. 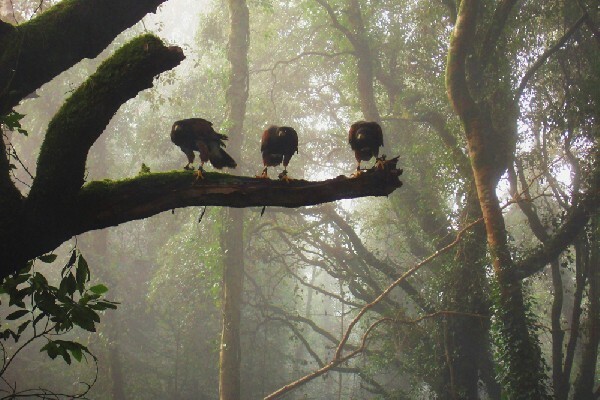 There are a few more of Aoife's brilliant photos in the February Guest Gallery. 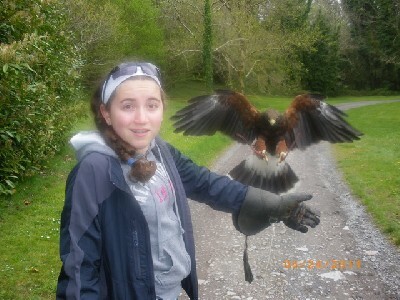 A budding falconer in the making! Here is Adam Hynes flying Fomhar recently. Adam has taken many Hawk Walks with us and is becoming something of a young expert. His experience and natural ability shows in his perfect handling of Fomhar in this photo. Although Swift is nearly 9 months old now, she still finds the world absolutely fascinating! Brian & Melissa Taggart sent this lovely photo of her playing with some moss on a branch when they flew her recently. 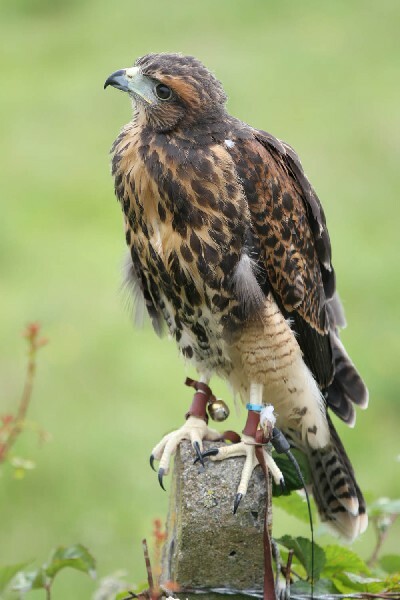 The photo also shows off her talons very well, it's a wonder she doesn't fall off the branch as she hardly appears to be gripping it at all!! 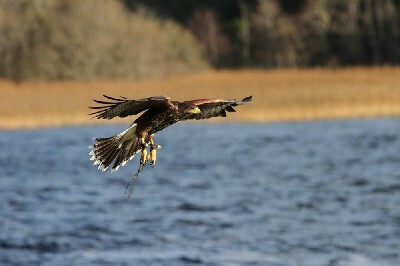 Here is Stoker flying just the other day by the lake at Ashford Castle. The babies are expert fliers now, gone are the days of misjudged crash landings! All four of them have handled the recent gale force winds with consumate skill. 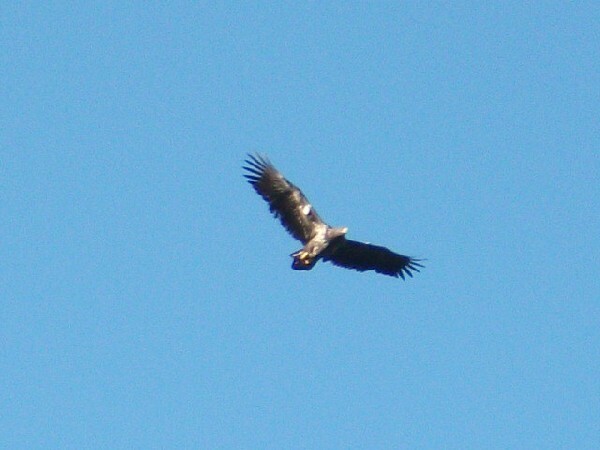 White-tailed Sea Eagle over Lough Corrib! Thank you to Tony Purcell for sending this brilliant photo of one of the released White-tailed Sea Eagles that he spotted over Lough Corrib. It is absolutely brilliant to have these birds around. Our female Finnish Goshawk is in fine form at the moment and hunting well. She has already caught quite a few crows and this photo shows her eating one of them! 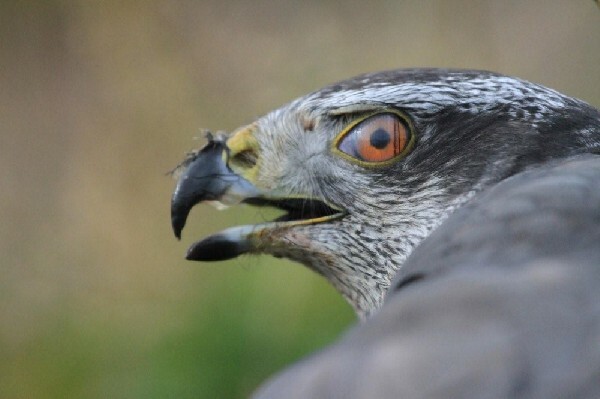 The camera just caught the "third eyelid' or "nictitating membrane' as it slid across the eye. If you zoom in you can see all the details of blood vessels. Here is wonderful Corrib (our 12 year old Peregrine / Saker hybrid falcon in action. He is flying as well as ever (if not better than ever!) despite his age. 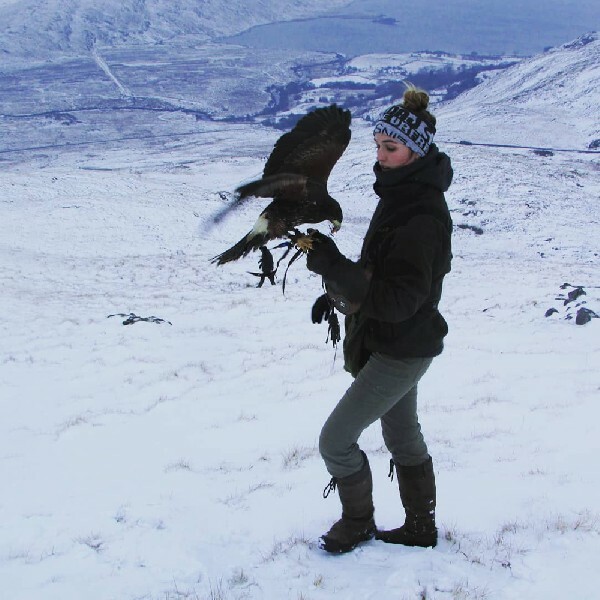 Natalie-Anne Downs flying Samhradh recently. Thank you to Natalie-Anne Downs for this outstanding photo of Samhradh flying recently. 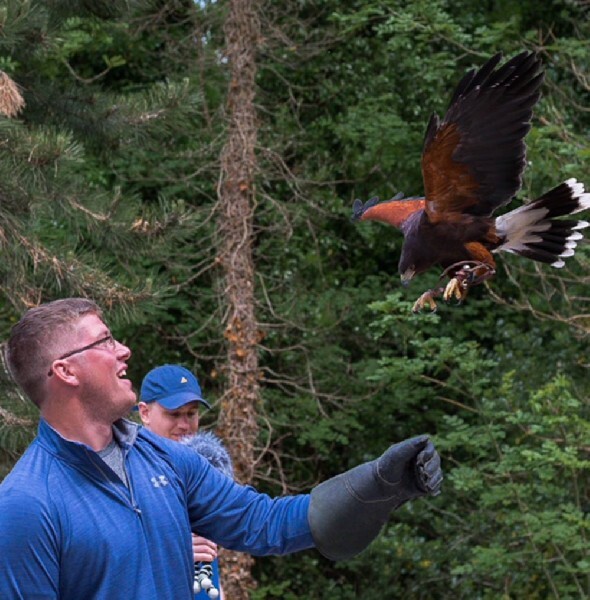 There are more wonderful photos of Natalies Hawk Walk in the September Guest Gallery. The baby hawks meet their namer!!! 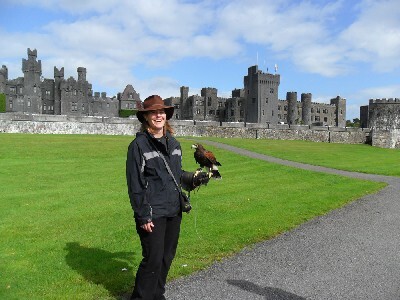 Melanie Murphy and Dave Comerford came yesterday to fly the babiy hawks that Melanie won the competition to name earlier this year. She thought up the winning names of:- Joyce, Wilde, Swift & Stoker after four iconic Irish writers. 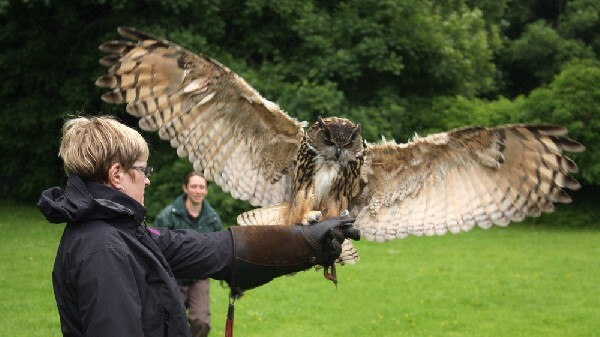 Here she is flying beautiful Joyce. 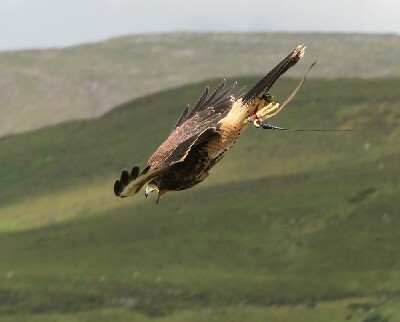 Thank you to Drew Braun and James Monegan for this outstanding photo of Uisce flying to them on their recent Hawk Walk. Further brilliant photos from Drew and James can be seen in our August Guest Gallery. 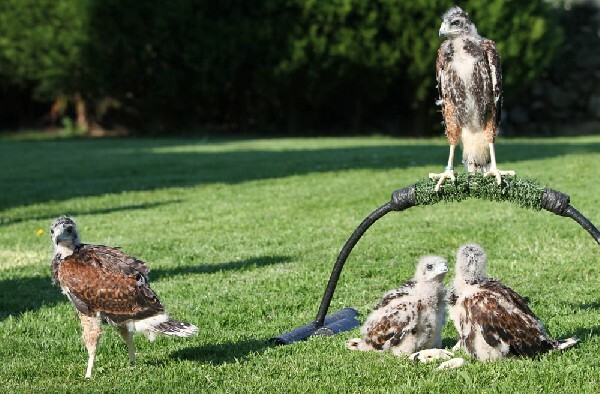 Flying lessons for the baby hawks! 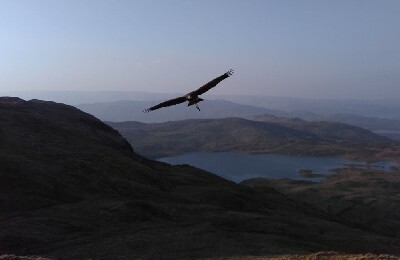 We all had great fun recently when we took the four babies up to the top of nearby Mount Gable overlooking beautiful Lough Cuillin for some serious flying practise. They quickly learnt how to use the wind and the updraughts and were soaring high above us - we were really impressed with their flying skills at only 12 weeks of age. They were spectacular. Joyce's beautiful (& unusual )tail! 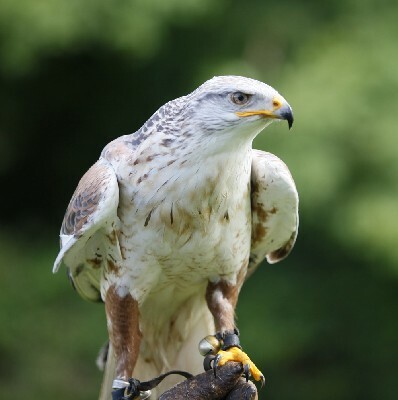 Well done to all who guessed correctly that Joyce's tail has 13 feathers instead of the usual 12!!! 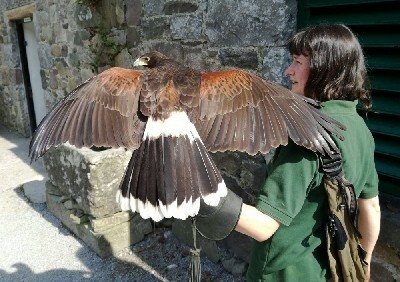 Rua also has 13 tail feathers and we have known one other female Harris hawk have the same trait! 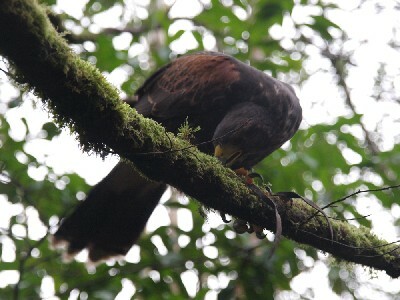 We have never known a male have 13 tail feathers though, only the females! 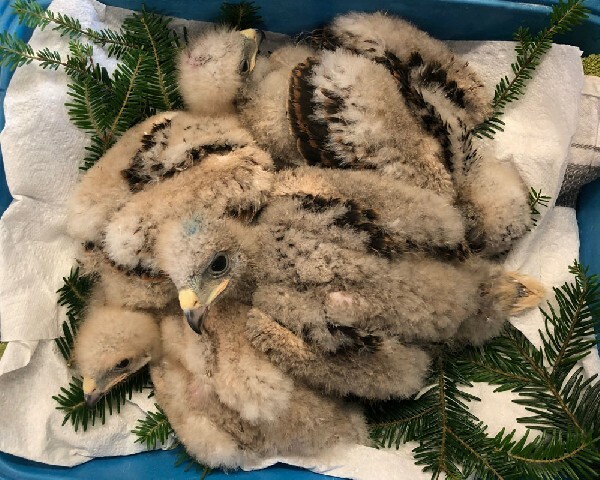 Update on the baby hawks. 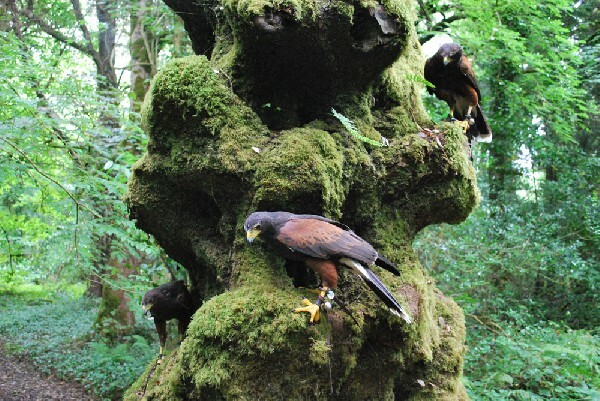 All four baby Harris hawks are now flying free and are exploring the woods around Ashford Castle. We are being very relaxed with their training at the moment so some days they are good and some days they are not so good. The two females have had a couple of trips out and about to start their hunting education, as you can see from this photo - they are easily distracted because everything is new and exciting, even a stalk of grass! 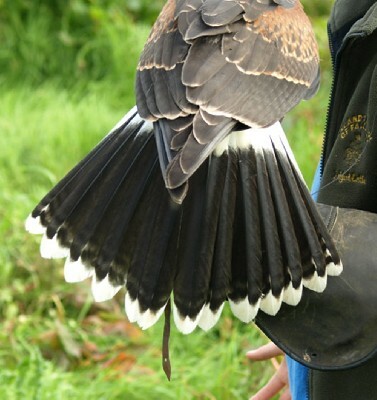 There is an interesting photo of Joyce's tail in their Gallery (New Baby Hawks Gallery) - there is something unusual about her tail, any guesses as to what it might be. This is one of the best photos we have ever seen - Wow! The newly named four baby Harris hawks!! Here are the four baby Harris hawks!!! Can you believe how much they have grown? They are now 10 weeks old and have just been named by Melanie Murphy who took part in (and won!) the recent competition to name them, they are:- Stoker (male), Joyce (female), Wilde (male) and Swift (female), all named after the iconic Irish writers. So far, their training is coming along well and they are all lovely characters. Today they all went for a two hour walk to get used to all the sights and sounds that their new world has to offer. 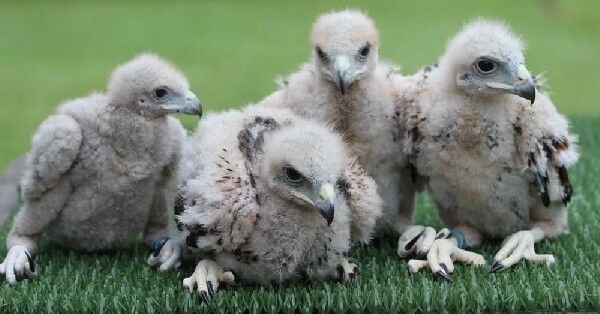 Individual photos of the four of them are in the New Baby Hawks Gallery. Thank you very much to Hannah Schaller for this outstanding photo of Dingle. The new arrivals at four weeks old! 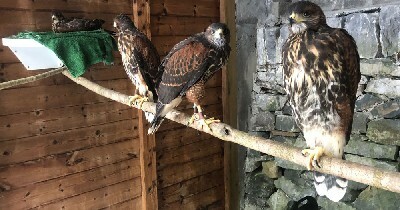 It is unbelievable how quickly our four new baby Harris hawks are growing - look at the difference in them from our earlier photos in their gallery!! They run and jump throughout the house, flapping their wings furiously in a comical attempt to fly, which they will shortly be able to do! They are turning out to be great characters, especially Mr Adventurous (pictured right) and we have fallen in love with them already. 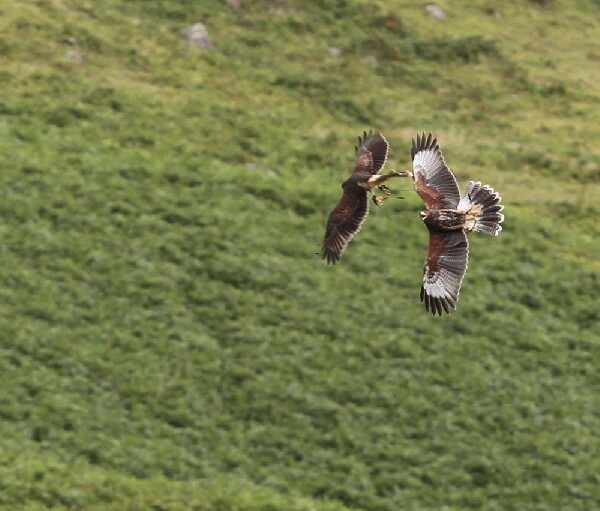 We had great fun flying four of our Harris hawks together recently! 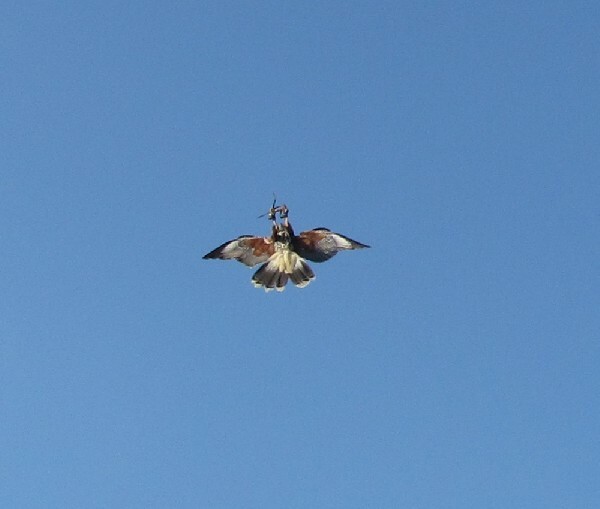 Thank you to Claudia Somes for this photo that she managed to take as she and her friends were flying the hawks. Last weekend we picked up four new baby Harris hawks!! We will keep you updated on their progress, together with weekly photos! Here is todays photoshoot!! 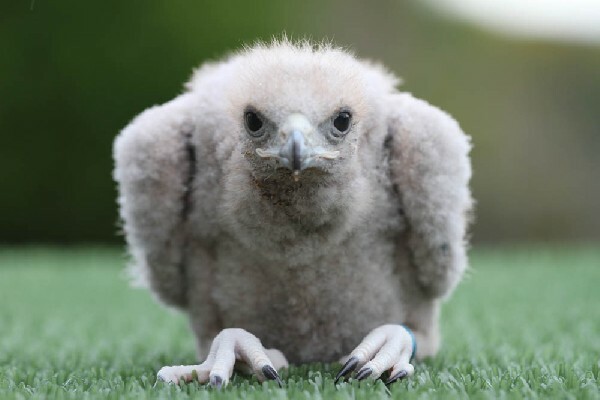 There are more photos in the "New Baby Hawks' Gallery. 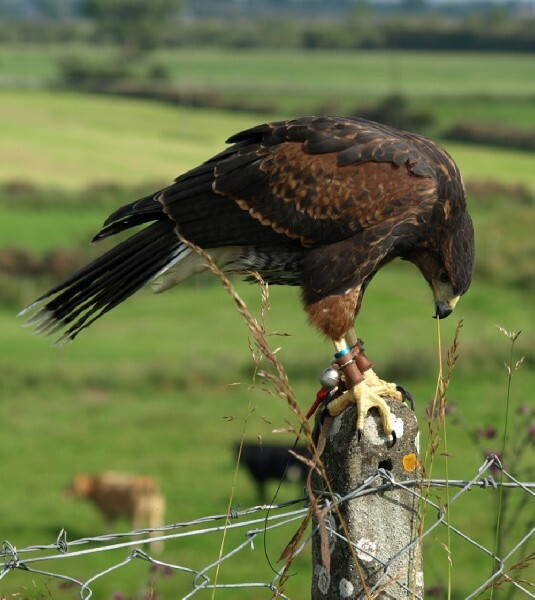 We are thoroughly enjoying our recent purchase of an altimeter that we can attach to the hawks. 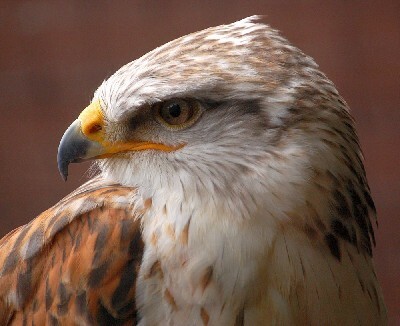 Reg, our Ferruginous Hawk (pictured right), is 20 years old and is the first hawk that we ever had. He has always been a high flier but we never knew how high.....until now. The altimeter first clocked him a few days ago at 1,443 feet! But, yesterday, he hit 1,575 feet! We will keep you posted, and fingers crossed for some hot days with thermals this coming summer! Thank you to Linda and Lindsey for this great photo of Rua coming into land! 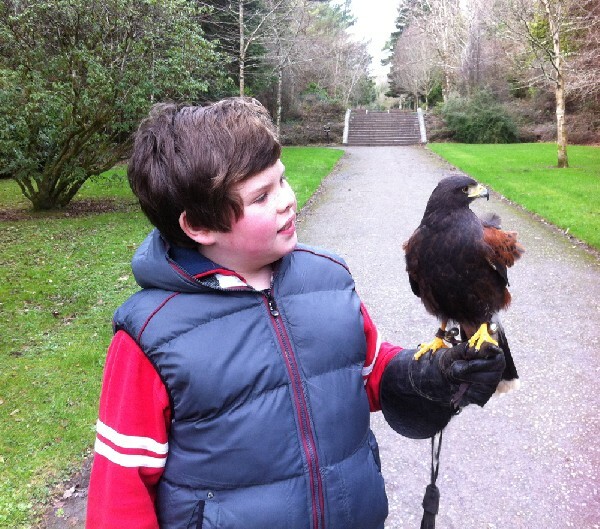 Thank you so much to Betty Walsh for sending us these great photos of Neachtans recent Hawk Walk with us, which was for his 7th birthday! The photos can be seen in full in Aprils Guest Gallery. Also thank you to Bill & Karin Amour for the great photos of them flying Burren & Skellig with us in their Hawk Walk, (also in Aprils Guest Gallery). 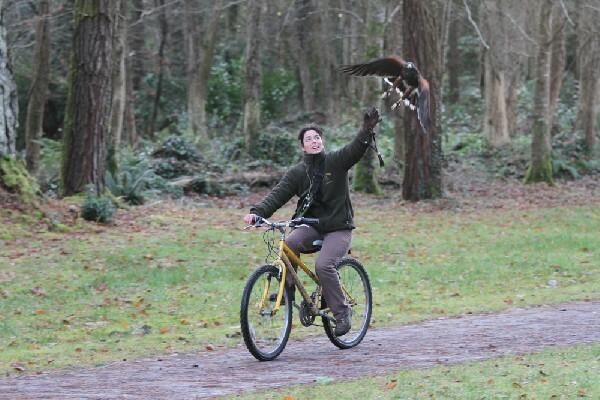 And good luck to Robert Duggan who is now starting out on his own long quest to becoming a falconer. 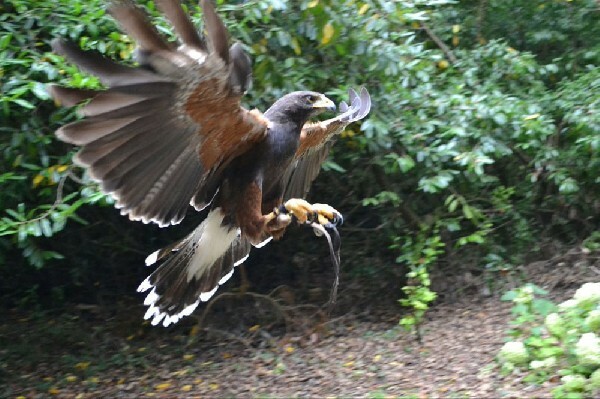 Thank you to Misty Sheriff for sending some of the best photos we have ever seen from her recent Hawk Walk with us. The photo opposite shows our three youngest male Harris hawks, in the mist!!!! 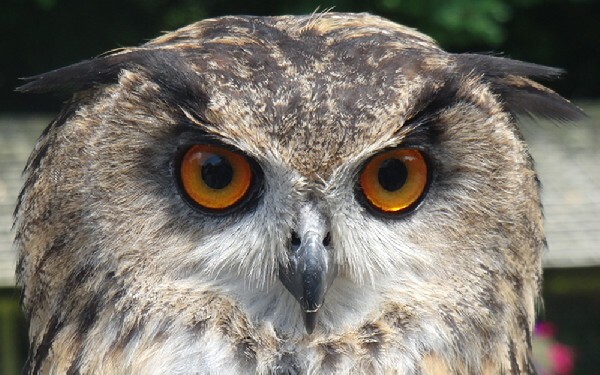 More of Misty's fantastic photos are in "January, February & March 2011 Guest Gallery'. Thank you so much to Liam Kane for sending in some great photographs of his recent Hawk Walk with us. Liam's photos can be seen in "January, February & March 2011 Guest Gallery' and opposite. Many thanks to Louise & Shannon for sending these great photos of their recent Hawk Walk with us and we look forward to welcoming you back to fly hawks with us again this Sunday. 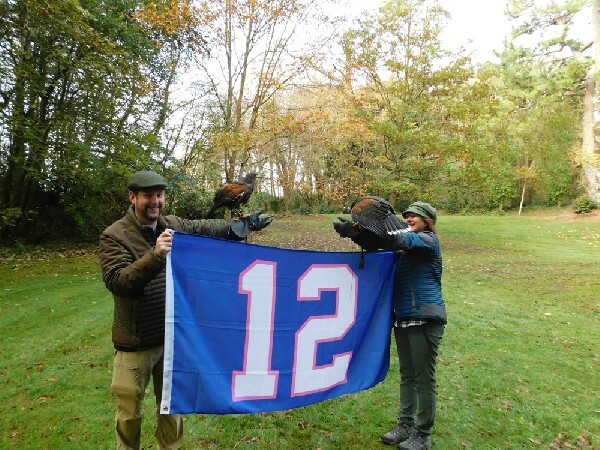 Thank you very much to Troy & Veronica Forrestal, Adam Hynes and Taylor Chambers for sending us this months photos of their Hawk Walks with us. Their photos can be seen in:- "January Guest Gallery' on the Gallery page.